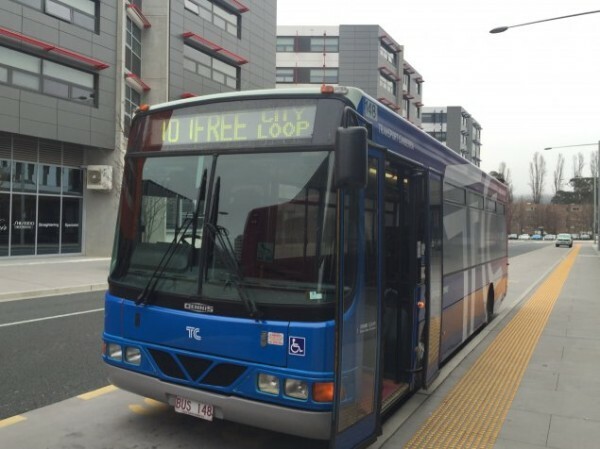 The Canberra Liberals have released their plan to counter the ACT Government’s recently announced free weekday City Loop bus: a loop bus of their own to run seven days a week over a longer route that would service an ANU circuit, the Australian War Memorial and Parliamentary Triangle, and for which users will pay. The Government’s City Loop bus (pictured below) launched on July 4, and attracted 1233 users in its first five days of operation. It runs every 15 minutes between 7am and 7pm Monday to Friday in a single direction, starting at the bus interchange and continuing past the Canberra Theatre, City Walk, and Canberra Centre, up Lonsdale Street, back down Northbourne Avenue, to the ANU bus station, along Marcus Clarke Street, to NewAction, around London Circuit back to the interchange. 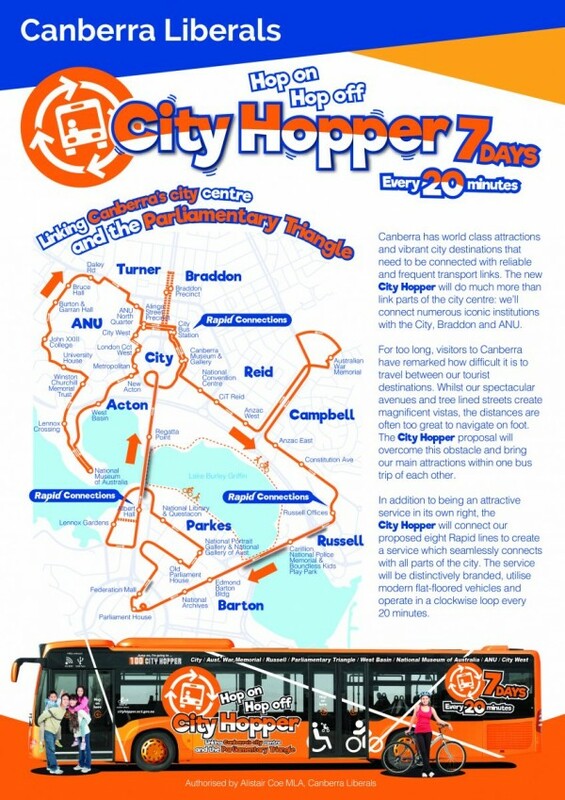 The Opposition’s City Hopper service would run every 20 minutes, seven days a week. Opposition Transport spokesman Alistair Coe said work commuters, students and tourists deserved an all encompassing and reliable city loop that serviced key locations. 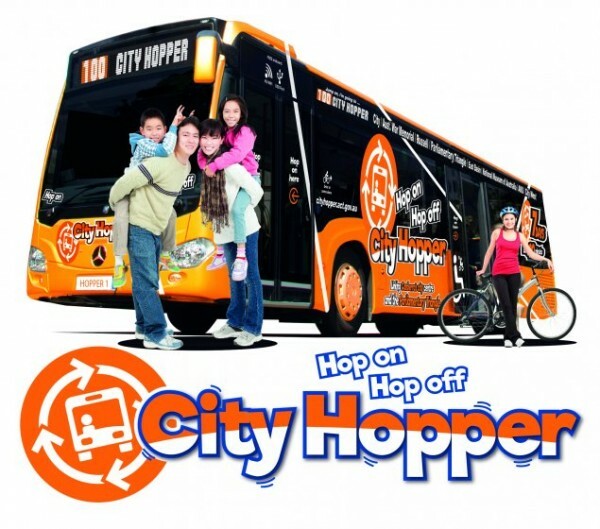 “[The City Hopper] will travel in a clockwise direction and intersect the City twice. It will go from the City, to the War Memorial and Russell Offices, then on to Barton, Parliament House, Parkes, back over the Commonwealth Bridge via Lennox Gardens to the City, through the ANU, before heading back to the City,” he said. The Liberals have not revealed what time the service would start and finish each day, but have said a single, standard fare ticket would last all day on their loop service. Transport and Municipal Services Minister Meegan Fitzharris welcomed the Liberals’ support for a city loop service but said only Labor was committed to keeping it free. “[The Liberals’ loop service] is not free, it’s less frequent, it looks like a very long journey, and they project fewer people will actually use it than currently use our free City Loop,” she said. Ms Fitzharris said this morning that 1233 trips in the first five days of the City Loop was a “great result”. “Patronage is expected to increase further in the following weeks with the return of school and university students from their break,” she said. The Minister said passenger boardings had been at their highest between 12pm to 2pm and 5pm to 6pm. The Liberals have yet to confirm operating hours for their proposed service, with 8am to 6pm on weekdays with reduced hours on weekends one possible scenario. When you look at the network now compared to what it was 5 years ago, it’s a million times better. If Canberra’s commuters agreed, the public transport commute mode share would not be shrinking. This will be a boon for tourists arriving on the international flights as long as it is well advertised at the airport. Even if ACTION achieves all of its patronage targets to 2018-19, that share will not reach 8%. Transport Minister Fitzharris admitted recently that, 14 years after the targets were set, the Government still won’t have enough information until after August to determine what measures will be necessary to reach any particular targets. Let’s hope that they can come up with some credible measures and targets before the election. I don’t have a drivers licence so rely on public transport (and my bike) to get around town. When you look at the network now compared to what it was 5 years ago, it’s a million times better. Every area of Canberra has had significant improvement in public transport in that time. The weekend timetable is still a shambles, particularly for Manuka & the eastern suburbs of Tuggeranong but if you compare the network now to back then, it’s much better. Someone should tell Megan than ~5 people per bus isn’t really the great result she’s claiming it to be. The current loop is pretty useless for anyone who has working legs and doesn’t mind a 15 minute walk. Considering the traffic lights in the city, it would probably take just as long to stroll from the top end of Braddon to New Acton! The Libs proposal is a much better one; it’s a longer loop that incorporates most of the things tourists actually want to see, and would even be useful for people working in the Parliamentary triangle. The downside is that it’s a paid service. Its a good idea, what would make it even better is if on the weekends it did an extended route to Kingston markets and Manuka and also if it ran both directions – probably half hourly. The ANU leg does seem a bit long, it probably doesnt need to go behind the war memorial just trun around at the roundabout, could loop around the East of OPH, could shortcut Lennox Gardens to Albert Hall skipping the Chinese embassy, exit Cwlth bridge straight to City West/New Acton, this would make it overall quicker and help frequency. It does need to be either free or cheap which the existing service isn’t (the existing hop on/off bus at around $30 will only appeal to very few tourists – its sad they would go out of business when they bought a new bus but they definitely need to innovate and make more their offering more competitive…maybe they do wider loop with other attractions like Arboretum, Govt House, Mint, Red Hill, Fyshwick, Majura Park, Mt Ainslie, Dickson, AIS, Black Mountain/Botanic Gardens – now that would be a good secondary loop as well. Good luck getting the Liberal’s bus around that loop in twenty minutes during peak hour. What’s wanted Bus that travels from Tuggeranong to Belconnen without stops between. Go as fast as you can. isn’t there bike lanes where the current city loop bus route ? A few short years ago we were all going to be wearing clogs and riding our bikes around the Civic Loop. Now it’s turned into a huge bus for big city people. Alistair it’s a bus route , At least people are using the bus and it’s not driving around empty . If you want a tourist bus have a dedicated painted up Free Canberra Tourist bus. A separate matter, Chase this up. Does the ACT GOV own street sweepers that clean the gutters around the suburbs ? If they do how often do they come around or do they tender out the job for a once over pass every 2 years or so ? In my area Belco they are full of thickly packed dead leaves and crap . Even the drain entry points in the gutters are pretty much sealed with c$!p. Given I support the light rail project and think Labor/Greens have done a fantastic job at improving public transport in recent years, I find myself quite surprised to be agreeing with the Libs on this one. The current city loop is not an effective service. It covers a distance that most people can walk and those that can’t have a multitude of buses to choose from. It is only a very short taxi ride to all places within the loop as well. The Libs route is not perfect but is superior. Apart from the unnecessary detour around ANU, it provides better coverage and allows tourists locals to get to places like the War Memorial and National Museum which are too far to walk for most people. Covering the museum on the tourist bus would allows ACTION to divert other services such as the route 7 away from there.Having these two attraction as well as the parliamentary triangle on a single route is better than driving in circles around civic. Both the City Loop and Centenary Loop are/were free. The city loop is running 360 services a week for 247 passengers per day. The centenary loop ran 112 services a week for an average of 380 passengers per day (in its first three months). I’m struggling to understand what need the city loop is actually fulfilling, especially at 7 in the morning. The Libs route is a lot better and doesn’t waste money providing a service at 7 in the morning which is not needed. I’d argue a service such as this shouldn’t need to run before 8 or 8:30. Free city loop bus services will unfairly compete with commercial tourist bus services like the Canberra Explorer, and will further undermine the Government’s failing efforts to reduce congestion and to increase walking, cycling and public transport. Not paying ACTION customers, who already can tack on an extra bus journey at no extra cost. Not people who commute by bike or on foot, unless they live close enough to switch to commuting on the free bus. The biggest winners will be tourists, not least because they will no longer have to spend precious holiday time figuring out how to buy bus tickets. People who would otherwise walk between east and west Civic will benefit, because the free bus will get them across Northbourne Avenue without having the lights change to red as they cross the median. Other than tourists, the biggest winners will be car commuters. The free loop will allow car commuters to take advantage of cheaper parking away from the city. 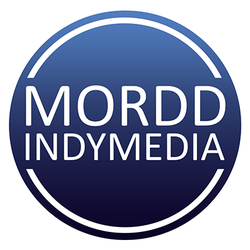 It will encourage more people to commute by car rather than to walk, cycle or catch buses. Coe is a joke, doesn’t offer any decent alternatives, and typical of the Liberal Party, point the finger elsewhere. Mr anti-Tram is all he stands for, absolutely nothing else. Do we need reminding of the mess Carnell and co left the ACT in! I hate to say it, I like the Libs proposed route better than the new free city bus loop, but it has to be free still! Any chance labour could just adopt the libs route? Although there is a private bus currently servicing this exact route, and of course Alistair Coe did not even reach out to them prior to pinching their route for his announcement, not that that’s a surprise. So that guy would need to be compensated. But I do like the overall proposed route though. Yes i am still a greenie, I can identify good ideas no matter where they come from, just like I supported the federal Libs (and Greens) on the Senate voting changes (and I accept my part in that for Hanson being elected so easily too yes). This is a stupid idea built on a stupid idea. This proposal will only benefit tourists who already use current ACTION routes. The City Loop is estimated to cost over $700,000pa – that’s 49 buses a day 5 days a week. The Libs promise is even more expensive. How ridiculous that both parties will spend nearly a million dollars on a completely unnecessary bus in the city, but refuse to ensure that the hidden parole program in Oaks Estate is successful by refusing to provide a bus for the program.